ASPIRE (Achieving Success through Parental Involvement, Reading and Education) breaks the cycle of illiteracy and poverty within families by providing comprehensive, integrated literacy services for the entire family. ASPIRE families have children 0-7 years old, parents in need of ESL and/or GED classes, and live in southeast Austin. Services are provided at our location behind Travis High School, as well as during monthly home visits. ASPIRE serves approximately 100 families per year. The White House Initiative on Educational Excellence for Hispanics named two Communities In Schools of Central Texas programs as Bright Spots in Hispanic Education on September 15, 2015 —ASPIRE Family Literacy and the XY-Zone. Read more. ASPIRE raises literacy levels of adults and children while increasing parents’ ability and confidence in supporting their children’s literacy needs at home and in school. School district performance data indicate that ASPIRE children academically outperform their peers even years after having left the program. Click here for additional information. 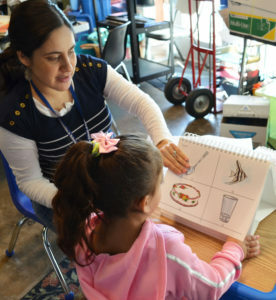 The ASPIRE Family Literacy program is supported by Austin Community College, The City Of Austin, Genevieve and Ward Orsinger Foundation, Travis County, and United Way for Greater Austin. ASPIRE Family Literacy was the 2018 Impact Austin Education Grant Recipient.